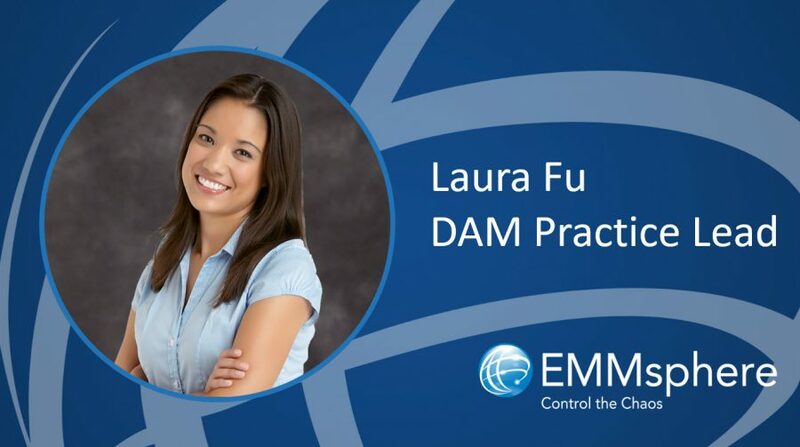 WINSTON-SALEM – August 16, 2018 – EMMsphere LLC, a marketing technology consulting and managed services provider, is pleased to announce the addition of Laura Fu, DAM Practice Lead, to accelerate EMMsphere’s mission to deliver DAM managed services for clients worldwide. “Laura’s background in Library Information Science, combined with her enterprise DAM experience, further expands EMMsphere’s capability to serve our clients throughout their entire DAM journey”, said Francisco Ruiz, SVP Advisory Services & Practice Development. Laura earned her BA in video production from Hofstra University and her Master of Library Science from the University of Wisconsin, Milwaukee. She began her career in 2002 as a technical director and video editor for local news in Michigan. After establishing and managing an internal news archive, she relocated to Baltimore to continue as a corporate news archivist for a national TV news outlet. In 2011, she joined the marketing team at a large retail corporation in Chicago, where she managed their enterprise DAM and maintained corporate taxonomies and automated data enrichment workflows. Laura moved to the service provider side in 2015, where she managed DAM design, implementation, training and customer success for various clients. “Laura will play a key role enhancing EMMsphere’s content-centric service offerings for our DAM clients” said Chris Kahler, CEO of EMMsphere. “Technology and solutions are always important, but enabling and managing the entire digital asset lifecycle needs to be the focus, and that’s Laura’s strike zone”. EMMsphere is a marketing technology consulting and managed services provider that helps organizations define, execute and expand transformational marketing initiatives by focusing on the right blend of technology, people and process. EMMsphere provides advisory, implementation, ongoing platform support, training and help desk services to ensure client’s goals and marketing solutions are always in perfect alignment. Since 2003, EMMsphere has helped over 40 Fortune 500 companies manage continual change across their marketing solutions. For more information, please visit www.emmsphere.com.